Welcome to the next installment of my new series Know the Facts. This month I am talking all about sweeteners, including both natural and artificial. Today's post is about Honey! This is part two of the sweetener series, following my post about Agave. 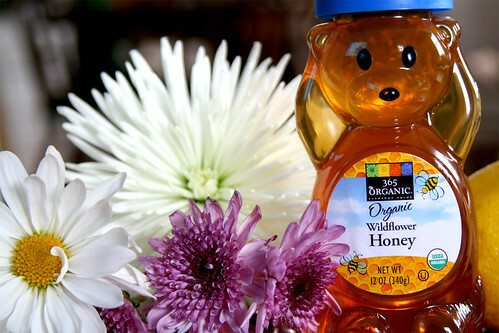 Honey is one of the few, if not the only, natural sweeteners that can be consumed without any processing what-so-ever. In fact, you may even find chunks of honeycomb being sold right out of the hive. Bees create honey using nectar from flowers. It is made through a process of regurgitation and digestion and is stored to be used as a food source for them during cold weather or when fresh food sources are scarce. The prominent sugars in honey are fructose and glucose, the ratio varies depending on processing, and there are also small amounts of sucrose and maltose. Honey is classified by floral sources. In North America you'll find varieties such as clover, orange blossom, sage, tupelo, buckwheat and sourwood. Most commercial honey is blended, that is a mix of two or more honeys. Polyfloral, aka Wildflower Honey is made from many different floral sources. As you may have noticed, my Whole Foods Organic Honey is of the Wildflower variety. From my point of view, the most important thing to consider when choosing a sweetener is the processing. That includes whether or not the product is organic. Honey that is certified organic is highly regulated and free of pesticides, herbicides, antibiotics and created in the most natural ways. Honey farmers that are non-organic routinely use sulfa compounds and antibiotics to control bee diseases, carbolic acid to remove honey from the hive and calcium cyanide to kill colonies before extracting the honey. Also, bees collect the nectar from plants that have been sprayed with pesticides. There are a variety of ways to process honey including crystalization, pasteurization, straining, ultrafiltering, ultrasonicating, whipping, drying and then of course, there is raw honey. The honey that you find in the supermarket is typically pasteurized or ultrafiltered. These are both high heat processes that kill yeast cells, liquefy, and remove extraneous solids and pollen grains. This kills the live enzymes and may decrease the nutrient quality that is found in pure, raw honey, which is a great source of vitamins and minerals and also contains antioxidants. Honey naturally contains niacin, riboflavin, calcium, copper, iron, magnesium, phosphorus, potassium and zinc! One point that is irrelevant to me, but you might find interesting, is that honey is not a vegan food. True veganism is a way of living which excludes all forms of exploitation of, and cruelty to, the animal kingdom. According to this, honeybees are included in the animal kingdom and therefore honey is an animal product. Any "vegans" out there that eat honey? Thoughts? So what are my thoughts on honey? Well, of course, first and foremost it's a sugar and like I always say, sugar, is sugar, is sugar and moderation is key. Having said that, I feel that honey is actually a great option as a sweetener as long as it's organic and even raw if you can afford/find it. From what I've read, non-organic honey farming practices have really gone downhill. I haven't looked into this far enough to say much about it, but I don't recommend buying non-organic honey at all. If you're curious, I encourage you to do some of your own research! I'd love to hear what you come up with. I hope this article has been helpful, and if you have any questions or comments I'd love to hear them! Great information (as always) I use honey often for my sweetener so I'm happy to now know more about the process. I will now be looking for only organic or raw honey. Great info, as always! I don't know if the honey I get is specifically organic - it's not marked that way, but since I get it from our organic meat CSA, I'm guessing it's probably pretty close to organic. I'm definitely going to ask about their farming method when I have our next pick-up. This girl does her research!!! Thanks for the informative post. It is easy to read too. That's hard to do, esp. when you've got all this scientific terminology happening. My POV on honey is - if it's not raw or organic - I don't bother. Even that 365 brand stuff is not worth it to me. It tastes different than the raw and organic honey. That leaves me skeptical about its processing and validity. Real raw organic honey tastes like icing. It's heaven! There's something sharp and yucky about the processed kind to me. I just don't like it. My vegetarian husband and I are building our first bee hive right now and hope to have honey this summer. Our honey will merely be strained. But our honey will NOT be organic because we can not control what flowers the bees visit, whether it is plants that have been sprayed or not. I would be curious to know how organic honey is 'made' - do they corral their bees somehow? I haven't looked into this...did you come across anything about this in your research? My husband will be starting his bee class in a few weeks so I will have him ask. Very interesting post. It caught my eye because we use honey in our home, mostly for digestive reasons. I just found your blog and I'll have to look around, you have lots of interesting stuff here. GREAT reporting! Really appreciated your agave article, too! Thanks for taking the time to research and write like you do. Keep it up.